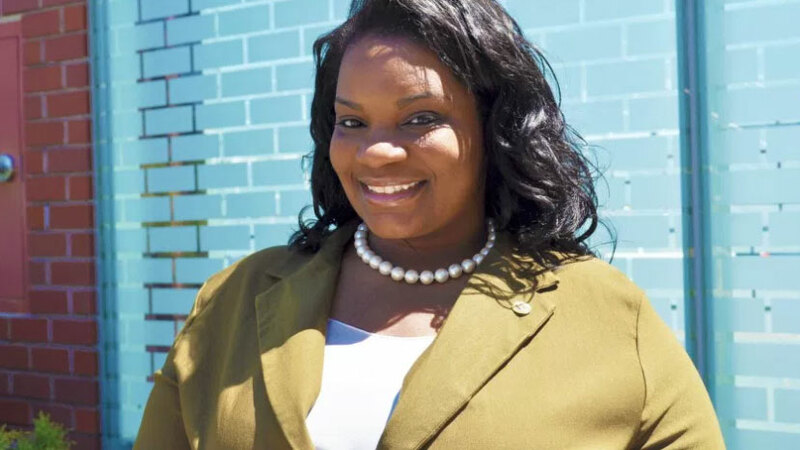 April Baskin won the Democratic Party’s endorsement to succeed Erie County Legislator Betty Jean Grant, who must resign her seat if she intends to run for mayor in this September’s primary. —Democratic Party Committee members in the Erie County Legislature’s Second District, currently represented by Betty Jean Grant, met two weeks ago to endorse a candidate in this year’s election. Grant evidently did not contest the endorsement, which seems to confirm that she is a “go” in the Democratic primary for mayor of Buffalo. Legislator Grant, however, could still carry two sets of petitions in June, one for mayor and the other for legislator, and defer her political decision until petitions must be filed in July. —Going into that legislative endorsement meeting the candidates included former Buffalo Councilman Charley Fisher; James Blackwell, son of former Erie County Legislature Chairman Roger Blackwell; and Duncan Kirkwood, an advocacy manager for the Northeast Charter School Network. Coming out of the meeting with the endorsement, however, was a political newcomer, April Baskin, whose LinkedIn profile identifies her as the executive director of the College Simulation Experience. How Baskin pulled off the endorsement is a bit of a mystery, although she reportedly has a connection with Deputy County Executive Maria Whyte, which may suggest that the Poloncarz political team had something to do with the endorsement coup. —City Comptroller and mayoral candidate Mark Schroeder will be following the news in the Second District very closely, given that a Grant-for-Mayor campaign would provide him some assistance in his Democratic primary against Mayor Brown. —Lancaster County Legislator Ted Morton’s seat will again this year be a focal point in the campaign to flip the Legislature from Republican to Democratic control. One name mentioned as a potential Democratic candidate is John Bruso, who has been active in community organizations. Jonathan Gorski, an attorney with Dolce Panepinto and one of Cheektowaga Town Justice Dennis Gorski’s sons, has also been mentioned for the race. —Speaking of control of the Legislature, rumors are flying about Democratic efforts to find an appointed political position for County Legislator Lynn Dixon. If Dixon were to pass on a run for another legislative term her district, which is better than two-to-one Democratic by party registration, would be a prime pick-up opportunity for the Democrats. —And will Republican Legislator Kevin Hardwick get no Democratic opponent this year? Hardwick was denied the Conservative Party line that he carried in past elections because of his legislative vote concerning ECMC bonding. —The entry of Erin Baker, wife of Republican County Chairman Nick Langworthy and Assemblyman Ray Walter’s chief of staff, into Amherst politics as a candidate for member of the Town Council, raises interesting questions about the Council candidacy of current Supervisor Barry Weinstein. Weinstein will need Wilson-Pakula permission from Langworthy to run as a Republican this year. “Extend voter registration”—how dare they!